Tim Whiteman joined Harleston when he was a young lad, progressing swiftly through our youth system and into our mens 1st XI before flying the nest and going on to represent England and Great Britain with many international appearances. Tim's interest in Hockey all started as a result of mini hockey at Magpies. 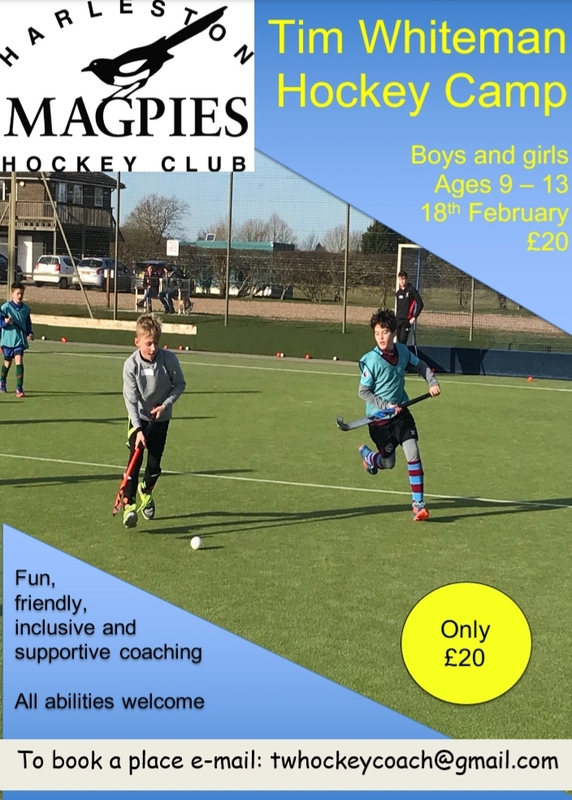 This February half term Tim would like to invite boys and girls in the age range 9 to 13 (school years 4 to 8) to join him for a day of hockey coaching whatever ability level at Harleston Magpies. Boys & Girls Hockey camp for ages 9-13. All abilities welcome. Lead by former GB star Tim Whiteman - £20 for the full day of coaching.Tim Whiteman joined Harleston Magpies Hockey club when he was a young lad, not so many years ago, progressing swiftly through our youth system and into our mens 1st XI before flying the nest and going on to represent England and Great Britain with many international appearances. Tim has returned to Magpies this summer to lead our men's first team and is transforming the way in which our players at this level prepare for games with new and innovative coaching ideas producing improved performances all round. However, Tim's interest in Hockey all started as a result of mini hockey at Magpies. This February half term Tim would like to invite boys and girls in the age range 9 to 13 (school years 4 to 8) to join him for a day of hockey coaching whatever your ability level at Harleston Magpies. If your son or daughter is interested in taking part in the camp and learning from Tim please book your place by emailing Tim at twhockeycoach@gmail.com.